The international conference will be held in context of the DFG funded research project “Open-World-Structures: Architecture, City- and Landscape in Computer Games” (Bonner 2017-2020) and addresses the matter of (1) architecture in game worlds in the sense of its media specific spatialization, architectural layouts and the role of architecture, as well as (2) the architecture of computer games themselves in the sense of systematics, structures and media specific logics between algorithms and databases – worldbuilding from a different angle. Thus, the participants will thematise aesthetics of reception as well as aesthetics of production and approach the complex constitution of computer games from a wide range of disciplines – from Media and Game Studies to Art History, Sound Studies to Architecture, Design to Phenomenology and Embodiment, as well as Spatial Theory and Cultural Studies. The aim of the conference is to channel multi-disciplinary approaches and current research projects to fuel an interest towards an understanding of computer games as spatial, architectural or world phenomena within the current digital media culture. Furthermore, it is to explore and discuss concepts and methodologies from other disciplines and the potential transfer as useful tools in Game Studies. Due to limited seating, advanced registration is required. Please contact mbonner uni-koeln.de for further details. Distant Agricultural Splendor: National Identity, Agricultural Labor, and Space in Farming Simulator (Derek Price) 10:45 a.m.
As Franco Moretti postulated in Maps, Graphs, Trees: Abstract Models for a Literary History, the “right objects of knowledge for literary history,” are not individual texts, but rather a combination of literary “devices” and “genres.” While devices are “very small” and can be discovered by identifying particular literary elements which recur across multiple texts, genres are “very big,” constituted by 100s or 1000s of texts, and present a challenge to typical methods of literary scholarship. To respond to this challenge, Moretti adopts methods of literary analysis that rely on analysis of bodies of texts at scale, applying data-analysis techniques and using the data gathered to make persuasive arguments about literary history. In this paper, I will adopt Moretti’s approach to understanding literary history and apply it to a phenomenon in videos games: the resurgence of the “simulator” game, beginning in the mid-2000s, and the flourishing of user-created content around these games. Using the popular Farming Simulator video game series by GIANTS Software as an example, I will try to understand which “devices” in user-created maps are successful, and how different “genres” of maps persist (or not) across different iterations in the series. By contextualizing analyses of particular, popular maps with large-scale, data-driven analysis of mod databases, I will be better able to discern exceptions from trends, and get a better sense of how modders around this series embed ideas of national identity, culture, tourism, agricultural labor, and space into the digital, 3D landscapes they create. Taking a Breath of the Wild – Paidiatic Spaces and Practices Off the Ludic Grid (Cornelia Janina Schnaars) 11:05 a.m. Unlike many open world games that still tend to be rooted in a developmental maxim of featuring locations that are remotely worth visiting in explicit quest objectives, the latest entry of the popular The Legend of Zelda franchise offers more potential prospects. 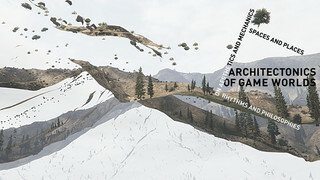 Based on Bjarke Liboriussen’s notion of the landscape as image, I argue that The Breath of the Wild offers places of interest that have neither narrative nor ludic relevance and by focusing on the very composition and atmosphere of intradiegetic wilderness, the effects on the player operate yet on a higher, extradiegetic level. Seclusion from the game’s main action is indispensable for these, sometimes sublime, experiences as it implies the rewarding feeling of a discovery possibly made by no one else. Enabled by the complex physics engine, various subversive play practices can be observed as well, disclosing yet another form of engagement with the gameworld far from the main quest arc, respectively even trying to undermine it. In this paper I shall outline non-standard experiences within the gamespace and trace their intrinsic value for the player. I seek to emphasize such strategies of spatial appropriation as being more than an instinctive urge to explore, which is ultimately grounded in the objective of survival, and not quite classifiable as tourist gaze either, because they immanently rest not only on a different way of the player’s perception but also on a form of exploration and manipulation of the gameworld that is solitary, active and paidiatic. Feels Right – How Atmospheres of the Past Satisfy Expectations of Authenticity (Felix Zimmermann) 11:25 a.m. The concept of authenticity remains lively discussed among German-speaking historians. While there are suggestions to abandon the term as its use in popular discourse worldwide has proven to be simplistic and vague while often being misused to push agendas of discrimination and marginalization, I will argue in my talk that it’s best to embrace and reclaim the term for historical game studies. To showcase the usability of authenticity for this field I will differentiate between historical authenticity and – the often synonymously used – accuracy while understanding authenticity as being based on pop cultural notions of history. Instead of affirming the quality of a depiction of history by comparing it to original sources, the player appreciates the experience in a given game world by drawing on a pop cultural collective memory. Consequently, the term authenticity in this context refers to a “subjective authenticity”. It can be argued that there are expectations of authenticity present which are based on this pop cultural collective memory. These expectations incorporate a certain “feel of the past” which needs to be approximated by a game to allow for a positive judgement of its world’s historical authenticity. By introducing the idea of atmospheres of the past I will offer a way to determine what this “feel of the past” is constituted by. Among others I will refer to Cornelius Holtorf and his concept of “pastness”6 to reveal techniques used to authenticate game worlds like these of Assassin’s Creed: Odyssey or Red Dead Redemption 2. Virtual Space and Video Game Photography: Towards a Socio-Political Reading of In-Game Photography (Vladimir Rizov) 12:00 p.m.
As Vivian Sobchack writes ‘electronic presence has neither a point of view nor a visual situation, such as we experience, respectively, with the photograph and the cinema’ (2000: 151). However, what happens when the third person experience of Watch Dogs 2 coincides with a POV use of a virtual camera? Furthermore, what is the implication for electronic presence, when a virtual photography mode is initiated and the user can manipulate the very weather of the virtual environment? As Galloway points out, shooter games already have expanded the ‘definitional bounds of the subjective shot’ (2006: 63), but the POV use of a virtual camera seems to not only be expanding the experience of the virtual game world, but simultaneously questioning it; both allowing for further immersion and potential detachment from the in-game world. This is particularly interesting, since games are widely considered ‘an active medium’ (Galloway, 2006: 83) that involves a player’s physical input and multisensory experience. However, while Galloway claims that ‘the primary phenomenological reality of games is that of action (rather than looking, as it is with cinema in what Jameson described as “rapt, mindless fascination”)’ (2006: 83), the case of virtual photography in-game problematizes this by converging action and reflection into a singular experience. I will explore this phenomenon from the socio-political perspective of Jacques Ranciere’s concept of the ‘distribution of the sensible’, where what is seen and unseen, visible and invisible, actionable and not are understood to have clear political implications for the makeup of the status quo. Finally, as a visual sociologist I will draw on my research into historical documentary photography and its practices of documenting social issues and urban space in order to draw a parallel to contemporary in-game photography. The World Machine: Self-Reflexive Worldmaking in OneShot (Theresa Krampe) 12:20 p.m.
“[W]e have developed the habit of thinking of computers as machines that take us into a separate reality – a domain conceived in terms of spatial metaphors“ (Ryan et al. 2016: 101), Marie-Laure Ryan writes in her 2016 co-authored monograph Narrating Space/Spatializing Narrative. In videogames, similar to narrative worldmaking (Goodman 1978; Herman 2009), the experience of immersion is linked to the creation of virtual worlds the player can enter. Narrative, landscape aesthetics, and affordances of gameplay such as exploration and player agency to alter the state of the world all contribute to creating a “sense of place that binds players to virtual worlds” (Ryan et al. 2016: 114). In the Independent Puzzle Game OneShot (Little Cat Feet 2016), worldbuilding becomes a central theme of reflection in the game itself. Based on the principle “the game knows you exist”, OneShot casts the player herself, unmediated by the avatar, as a presence in the game while the NPCs proceed to cheerfully ignore the fourth wall. Indeed, the game’s very codes and files enter the diegetic space of the game and, in turn, the spatial design of the gameworld is mapped unto the file structure on the actual computer. Inviting the player to engage with the links between game world and actual world, the game thus draws attention to the aesthetics and mechanics of worldbuilding in videogames, but also to the spatial metaphors that shape our understanding of digital technology. Towards an Operationalized Definition of Procedural Representation (Michal Švarný) 12:40 p.m. Procedural rhetorics as proposed by Ian Bogost (2007) have had a significant impact on the conceptualization of how games convey meaning and has served also as an influential game design paradigm (Sicart 2011). Yet, the concept was also subject of criticism, mainly due to the dominant role procedurality is ascribed to have in conveying the meaning and persuasiveness of videogames, arguing that there is more to the meaning of videogames than the games’ mechanics and rules (Sicart 2011; Möring 2013; Deterding 2016). The present debate was on both sides predominantly held on a theoretical level and to my knowledge there have not been any empirical studies examining the effects and interpretations of procedural rhetorics. One of the challenges of such a research would be also the lack of a concrete operationalized definition of procedural representation that could be the basis of an empirical research design. The aim of this paper is to provide such an operationalized account of what procedural representation is, that will be used in my further research as the basis for the design of a laboratory experiment aiming to verify whether a measurable effect on attitude change among players can be attained by modifying only the procedural elements of a game. Registration / Lunch 1:00 p.m.
Welcoming Speech / Introduction (Marc Bonner) 1:30 p.m.
Protean Spaces. On the Aesthetics of Reconfiguring Game Spaces (Hans-Joachim Backe) 2:00 p.m. Even to this day, most game spaces are hard-coded in their geometry. With the obvious exception of Rogue-likes, gameworlds can traditionally be expected to have a certain permanence to them. This general assumption has been undermined in recent years through the prevalence of procedurally generated worlds in games of all genres and scopes, from Spelunky to No Man’s Sky. There have also been noteworthy examples of malleable environments before the hallmark of Minecraft, in e.g. the Red Faction series, and games that toyed with the idea of non-Euclidian geometry, e.g. Antichamber. Recently, though, an increasing number of games has used clandestine reconfigurations of space to great effect. Batman: Arkham Asylum’s Scarecrow sequence has been discussed in this regard quite frequently already. Hellblade: Senua’s Sacrifice and Layer’s of Fear are veritably built around semi-scripted, procedurally instigated reconfigurations of game spaces. Drawing on the well-established theories of game spaces, gameworlds, and environmental storytelling, the talk will investigate the functions of these changes to the game environments on a mechanical, representational, and narrative level. The goal is to explore if there are shared aesthetic principles at work, and if so, which overarching design strategies can be identified. Learning from Las Vegas … About Video Games and Virtual Reality Experiences (Gundolf S. Freyermuth) 2:45 p.m.
“What happens in Vegas stays in Vegas.” This popular marketing slogan evokes Johan Huizinga’s “magic circle.” Both concepts claim a radical disconnect between the ‘real’ world of consequences and another more playful realm of gambling or gaming. However, beyond the usual sins associated with the City of Sin, what is it exactly that happens in Vegas? In Learning from Las Vegas, Robert Venturi et al. describe how the “intricate maze” of the desert city “disorients the occupant in space and time” by making both appear virtually “limitless.” The seminal architectural study was first published in 1972, the same year Atari released Pong. Since then, Las Vegas has shed most of its neon fantasy facades in favor of themed 3D-environments, from animatronic and theatrical representations of fictional scenarios (such as Treasure Island’s pirate bay) to the emulation of fantasmatic cities such as Venice or Paris. For more than a decade, starting in the early 1990s, most of these simulacra spawned themed and hybrid analog-digital rides, the most spectacular of them being the $70 million interactive extravaganza Star Trek - The Experience (1998-2008). – My talk will focus on the interplay between Las Vegas, environmental storytelling, and digital games. Specifically, I seek to address how Las Vegas architecture since the 1960s and its hybrid rides anticipated – in the Benjaminian sense – virtual experiences of faraway or imaginary worlds. I will also consider the several dozen digital games set in Las Vegas which have tried to catch up with these themed environments in an attempt to virtually replicate the unreal experience of the ‘real’ city. Labyrinth (Rolf F. Nohr) 3:45 p.m.
Based on the idea that the computer game exists in a kind of ‘fetishistic’ relation to space and topology (Nohr 2007), the paper aims to approach the figure of the maze in relation to the computer game. The labyrinth is a metaphor, an ‘archetype’ and a praxeology of the game. It is an ambivalent formation of both orientation and disorientation. It evokes pathfinding as well as it simultaneously blocks the (linear) path (Bexte 2007). It limits the subject and functions as a machine of training (or: trimming) and yet provokes the breakout and break-through. It is a metaphor for individual experiences of excessive demands (Theseus) as well as seeing the maze as a function of order (Ariadne). The computer game is to be understood as a permanent labyrinth. The paper would like to focus on the figure and practice of the test (the ›rat in the maze‹). Significantly, Claude Shannon's Theseus-machine serves as a starting point. The story of the Maze Solving Machines can be read as a discourse on epistemology of media, topography, and cybernetics. But it there is also a rather ‘praxeological’ reading of the ‘mechanical labyrinth rats’: "Cake and grief counseling will be available at the conclusion of the test" (GLaDOS). Personal and Cinematic Landscapes in Games (Rune Klevjer) 4:30 p.m. The film The Tree Feller (2017) offers the rare and unlikely experience of watching a fictional story unfold in the environments and landscapes of my own small hometown in rural Norway. Such a blend of actual and cinematic experience has a unique appeal. In my own case, the film’s themes of home and alienation further resonated with personal experience, deepening the relationship between depicted landscape and personal memory. I will suggest that many videogames have a similar kind of ontological structure and appeal; their environments are being staged as landscapes of personal experience and memory, while at the same time being projected as landscapes of cinematic storytelling. I argue that theorising a gap and a tension between personal and cinematic experience, between reality and image, does not impoverish the aesthetic value of such games. On the contrary, it points to the unique way in which videogames are able to re-stage, within themselves, a dialogue between life and fiction, rooted in sustained engagement with (and against) virtual environments. Ludoforming (Espen Aarseth) 5:30 p.m.
Ludoforming is the practice of turning real, fictional, or historical landscapes or cityscapes into ludoscapes; that is, into maps, levels and worlds for gaming. What are the effects of such editing on the produced ’scape? How much remains of the original structure, shape, and layout, both in terms of topology and topography? While landscapes always are constructed and interpreted by humans, are there further constrains on ludoscapes, because of their more singular purposes? Are there editing patterns that can be observed across these ludoscapes? I will look at a handful of particular examples, from Fallout 3, the Stalker games, and not least Red Dead Redemption 2, for clues about what, if anything, characterizes the practice of ludoforming. Get Together / Dinner 6:45 p.m.
Borderless Sound (Marcus Erbe) 10:00 a.m.
For various technical and practical reasons, many games that are available on the PC platform allow the user to switch between three display modes, usually referred to as the fullscreen, the windowed and the windowed borderless mode. Especially if one chooses to play in windowed mode, it becomes apparent that the visual side of gaming is a rather framed experience, since one catches sight of a screen (marked by the window frame of the running application) within a screen (as indicated by the edges of the monitor, TV set, etc.). This particular situation calls to mind Michel Chion’s theoretical musings on the spatial relations between image and sound in film, of which one may quote a brief but concise definition: “If we can speak of an audiovisual scene, it is because the scenic space has boundaries, it is structured by the edges of the visual frame. Film sound is that which is contained or not contained in an image; there is no place of the sounds, no auditory scene already preexisting in the soundtrack” (Chion 1994: 68). Following this train of thought it could be argued that unlike the visible content of a film all its sonic events are indeed without borders, because they are being projected into a three-dimensional space rather than being projected onto a surface. Consequently, film sounds obtain their specific spatial identity, as it were, from returning to the visual fold. However, even if certain sounds become glued to the image, they still have the potential to expand the cinematic space beyond that which is visible at any given moment. I would like to pose the question whether the same can be said with regard to a medium that depends on computerized processes for its construction of audio-visual worlds. Since video games are software, they are prone to all sorts of unintended relationships between image and sound. How does it affect the perception of a game’s spatial boundaries when there is a mismatch between the said elements? And what are we to make of virtual reality games, in which traditional notions of screening or rather of an enclosed visual space begin to crumble? »I love how you can see the bottom of the universe from this room…« The Inside-Out-Architecture of Davey Wreden’s The Beginner’s Guide (Benjamin Beil) 11:00 a.m. The Beginner’s Guide is Davey Wreden’s follow-up game to the critically praised The Stanley Parable. It is a collection of half-finished experimental games created by a developer named Coda. Davey Wreden, the ›curator‹ of this collection, guides the player through these game fragments in order to explore Coda’s (or Wreden’s?) personality. The Interior of Video Games (Thomas Hensel) 11:45 a.m.
Two Ways to Dwell: Hestial and Hermetic Dwelling in Digital Game Worlds (Daniel Vella) 1:30 p.m. This presentation will draw upon the philosopher Edward S. Casey’s argument that human being-in-place is structured around the interplay between two ways of dwelling, which he terms hestial and hermetic dwelling (1993: 133). The figure of hestial dwelling is the hearth and the home – it is centralizing, inward-gathering, and emphasises lingering and remaining. Conversely, the locus of hermetic dwelling is the path – it pulls outwards and onwards, encapsulating the spatial functions of movement and traversal. On this basis, I shall make the claim that most existing approaches to the spatiality of game worlds have assumed that the player’s mode of being-in-place in game worlds has a character that closely matches Casey’s notion of hermetic dwelling. From Aarseth’s founding of a theory of ergodicity upon the image of ὁδός - hodos, ‘path’ (1997: 1) – to Calleja’s argument that exploration is the impulse that structures the player’s spatial involvement with digital games (2011: 73), existing literature has characterized the player’s practice as being one of progression and traversal – the term ‘walkthrough’ is particularly indicative here. This presentation shall consider a number of games – from Animal Crossing: New Leaf to Minecraft – that structure a hestial way of dwelling in the game world for the player, through spatial practices like the establishment of a centre, the demarcation of inside and outside, and the establishment of patterns and return and lingering. The ‘Lived Spaces’ of Computer Games (Stephan Günzel) 2:15 p.m.
Against the background of the spatial turn and its impact on Game Studies the presentation will focus on the spatiality of computer games and the relation of their virtual nature to architecture. Hereby it is relevant to gain a decent understanding of what according to the urbanist Henri Lefebvre can be addressed as the ‘lived space’, since computer games are mostly conceived as mere ‘representations of space’ that lack the respective dimension. Rather, the history of this medium reveals the potential for creating an experience of impossible spaces and architectures. This is not only true for recent games (like the ‘four-dimensional’ games Portal, Manifold Garden or Miegakure), since also early computer games can be accounted for an experience of ‘virtual’ space as alternative geometries or physics (like the warped space of Asteroid, the mashed perspectives of Space Invaders or the topic space of Tetris). Under this premise architecture is not per se bound to the physical reality. Sense of Being Here: 3D Spaces Between Vision and Haptics (Carolin Höfler) 3:15 p.m.
With the growing penetration of new VR and AR glasses onto the mass market, relations between bodies and outer and inner environments become increasingly interconnected via screen-based, interactive moving images. The interactions with and through screen images lead to a specific alignment of the body in both the virtual and physical space. Being a player in physical-digital theme parks like The Void or supposedly flying via the full-body installation of Birdly are aimed at generating an intense perception and a powerful body mobilization. Closely related to this is the question of how and how much our perception changes if the physical room where the user is located is not replaced by fictitious pictorial worlds but instead digitally constructed and can be operated and steered via VR glasses. By the same token, the question arises as to how our perception changes if facets of the virtual space are physically reconstructed and are thus perceptible for the body. VR glasses seem to appear transparent since they let the viewer look into a photo-realistic, stereoscopic digital model of his direct environment. It is thus not only important how the physical-digital 3D space is visually presented and perceived; critical is how the given data of both environment and body interact and communicate – also with regard to an interaction pattern between display imagery and the beholder’s perceptions and actions. The new entanglements between the physical »form of being« of the tactile space and the digital »form of effect« of the visual space in advanced VR environments fundamentally alter the idea, concept, and design of architectural spaces. With regard to the realm of designing, the construction of specific spaces of action characterized by the interplay between human bodies, technical things, and physical surroundings is currently coming more and more to the focus of attention. On the one hand, the built spaces are being cross-linked through chips, tags, and sensors; on the other hand, they are designed to evoke specific sensory experiences. In such settings, what is and will be the function of architecture? In hyper-realistic physical-digital VR environments, the materially bound spatial forms primarily serve as image carriers and step behind the digital interface. The question arises as to how to envision, design, and develop an architecture that does not constantly validate the perception of being in a virtual space (»sense of being there«), but rather challenges it through creating a sense of presence in the physical space (»sense of being here«). The Architectural Continuum – Choropoietic Media and Post-Physical-World Spatial Aesthetics (Constantinos Miltiadis) 4:00 p.m. Since the turn of the century, scholars have argued for videogames as allegories of space, for game design as narrative architecture and for the focus of games on space as an altogether paradigmatic shift in both their production and consumption. This new paradigm, however, requires and engages with a practical and empirical approach; a different mode of literacy concerned with developable reasoning and abilities relevant to spatial, instead of the more commonly used logical-analytical, cognitive faculties. The proximity between architectural and game design practices, on the other hand, appears today to be closer than ever. VR is already being used as a representational and evaluation medium for architectural design, and videogames are employed as design and simulation tools for urban planning. This presentation however is concerned with the inverse rhetoric. As renaissance architecture following the invention of perspective argued for architecture as the drawing, distinct from its material manifestation, similarly today, we can speculate on a continuum that extends to architectures intrinsic and specific to the videogame medium. Drawing from the evolution of spatial concepts through mathematics and physics, we can suggest and design novel spatial configurations that escape the obsolete cartesian flat-earth underlying paradigm that both CAD and game development software presuppose. Commercial games have already shown spaces that while physically inconstructible are perfectly perceivable by our sensory apparatus, and in which we can reason and act upon. This new class of post-physical-world navigable environments, eventually suggests an expanded field of architecture, exploiting currently latent cognitive abilities and simultaneously implying a new, undiscovered domain of spatial and potentially architectural aesthetics. Dreaming in the Witch House (Thomas Hawranke) 4:45 p.m.
»Gilman’s room was of good size but queerly irregular shape; the north wall slanting perceptibly inward from the outer to the inner end, while the low ceiling slanted gently downward in the same direction. Aside from an obvious rat-hole and the signs of other stopped-up ones, there was no access—nor any appearance of a former avenue of access—to the space which must have existed between the slanting wall and the straight outer wall on the house’s north side, though a view from the exterior shewed where a window had been boarded up at a very remote date« (H.P. Lovecraft, The Dreams in the Witch House, 1932). Dreaming in the Witch House is a lecture that combines different materials in a performative presentation. It centers around the short story The Dreams in the Witch House written in 1932 by American author H. P. Lovecraft. The lecture concentrates around the theme of research, where one tries to find out something, that he or she doesn`t know yet. The architecture of the witch house serves as a catalyst for different topics that are combined with the representations of in-game borders, border-glitches, the Out-of-Bound space and the level architectures of different video games. The lecture will evoke the fear of the unknown, where uncertainty prolongs the exploratory movement and where the angles, corners and walls of the witch house create a passage for artistic endeavors beyond the borders of the architecture. The journey will lead to different outcomes: From the ecstasy for the things that lie beneath, to interspecies dreamers and the geographic position of the modern-day witch houses. In a performative act, these topics are combined with a sculpture, with different voices and with game engine architecture. The witch house is calculated and summoned within the point-cloud forest that surrounds its walls and roof. Round Up Discussion 5:45 p.m.